What a lousy banner that would make. Imagine it strung over the main street of your mid-sized American town one summer. The circus is coming, and it’s a Good thing—would you buy a ticket? Maybe, but that’s not why. You’d buy your ticket, and tickets for your kids, because this circus—Circus Smirkus—blows your socks off. Who cares if it’s a circus made up of youth performers? Never mind that it seems a place of belonging for them—so much so that they weep when its seven-week annual tour is done. It’s the end-product that sells. And here’s how you get to it. Circus Dreams is no masterpiece, but it never bored me, and it won’t bore you. It won’t bore your kids either, and that’s relevant here, because Circus Dreams is the closing night film for Sprockets 2011, the Toronto International Film Festival’s cinema program for kids. 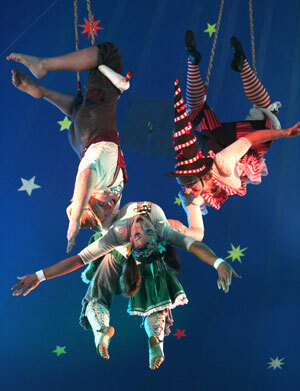 You’ll see the usual clown routines, tumbling and juggling—challenging stuff, if not exactly scary. But then you watch three girls, entwined in hoops, pulled near to the full height of the cupola, performing without nets or wires (“you can’t use them, they get in the way,” one explains) and you’re impressed in a different way. With the exception of animal acts and fire, there’s nothing this group of 12- to 18-year-olds won’t do, or at least try. They don’t join the troupe cold. Each auditions; bringing a particular, and pretty advanced talent to an event that seems like the season opener of American Idol, only smaller, and really, really, uplifting. The judges, a pair of young guys who’ve been with Circus Smirkus for years, could not be nicer. In fact, as goofy as they are, you get a real impression of gravity from both of them, as it’s clear they know how fragile their future charges are. Being a teen is tough—it’s cliché, but true, and especially for these kids, already different enough, and now pursuing things that require them to stand out even more. Producer/Director Signe Taylor sticks close to her little-human-story template. Of a potential cast of 27 kids, we meet a handful, mostly rookies, who take us on their journey through auditions, training, fitting in, performing, homesickness, and the grind of the road. We’ll hear commentary from many others, but there are only four we really follow: a 12-year-old dancer/aerialist, a shy stick-juggling boy, and two girl clowns. Training is a mere three weeks, in dingy, summer-camp-like conditions, not that anyone minds. I was surprised to learn that these kids, having earned their spots performing a particular act, still had to compete for roles within the show itself. This puts the newbies’ insecurities on display. One of the girl clowns tries out for a balletic aerial act because, she admits, it makes her feel traditionally feminine. 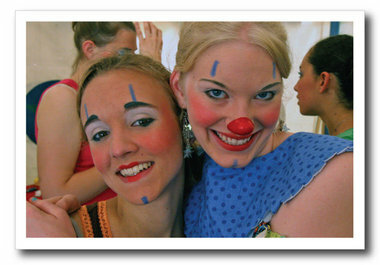 Her partner, less boisterous but more talented, seems more interested in what it means to be a female clown. “We always play it straight, while the boy clown gets the laughs,” she complains. She’s sick of it. I hadn’t thought about that before. And watching the girl clowns struggle through rehearsals of a ‘proven’ headhunting routine, I got a real sense for how such preconceptions—in the audiences’ minds, but also in the performers’—can make something fall flat. “I know this material works,” groans the trainer. He wrote it, and performed it to huge laughs. But though the clowns are good, they can’t make it funny. Nobody’s sure why. Maybe it’s because they’re girls. Maybe not. Where precision meets the ineffable ‘it’—there’s good art, I guess. Ponder that, watching Circus Dreams, and also learn, learn, learn: about every weird circus contraption you’ve seen before but couldn’t name. This was a big joy of the film for me: discovering, for example, that the hoops the starlets swing in at the top of the tent are called ‘lyra’; and that ‘diabolo’ is the name for those breadloaf-sized spindles I’ve seen buskers fling in the air with a pair of sticks attached by a string. Or that a diabolo doubles act, performed successfully with five spindles at once, ranks you among the best in the world. “You need a special kind of brain to calculate those tricks,” says one of the clowns. 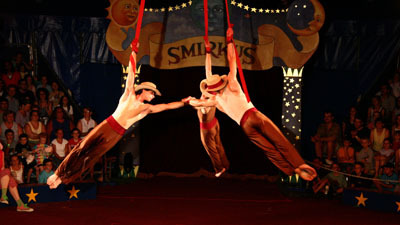 Circus Smirkus’ diabolo-performing brothers, we later learn, are studying at MIT. Did I mention that Circus Smirkus is in trouble? “If we don’t break even, this season will be our last,” says founder Rob Mermin, looking straight into Taylor’s lens, grave-faced. There’s logistics, rising fuel costs, the fickle weather (if it’s too hot or too wet, the audiences thins)—many variables. We see a couple of poor houses, and then the founder again, mulling over a spreadsheet. Will staff have to be let go? Will Smirkus survive? For that matter, will Thula, Joy, Maddie and the other rookies master their roles, fit in, and find love? These questions pop up from time to time, but the kids seem uncomfortable answering them, and Taylor’s not ruthless enough to push. That would be a bad thing if Circus Dreams was The Amazing Race. But it isn’t, and it doesn’t need this manufactured drama to keep our attention. The charm of this film is its kids—just being kids—and the sweat, and the pain, and the glory of pursuing something they love to do. And learning what a ‘diabolo’ is. I’m such a geek. Circus Dreams screens this Thursday, April 14, at 10:15 am, and again on Sunday, April 17, at 4:15 pm, at TIFF Bell Lightbox in Toronto. Circus Dreams is part of the 14th annual Sprockets festival, showcasing more than 100 films from 28 countries for children aged 3 through 18. It was a film that made me smile, seeing people like me doing things so.. different. I agree, the charm of the film was the kids--how they each handle being under the pressure of "The Circus". It really opened my eyes to see that kids can pursue their dreams if they believe in themselves. And also that there is a spot for everyone in the gigantic jigsaw of life but they just have to keep looking until it's found. That's the real lesson of this film, and I want every teenager to learn it and live it.